My passion for the art of beauty developed as a young girl living in Russia. I would accompany my mother to the local beauty salon where she would be pampered, primed, and prepped to look her best. Watching my mother’s mood change instantly for the better after leaving the beauty salon, I was intrigued by how a hair cut and a style with a few sweeps of blush on the cheeks could transform a woman’s self confidence. I envied the beauticians at the beauty salon for raising my mother’s self esteem after every appointment and decided that I would one day be that person who can bring a smile to my fellow peers; making them feel better about themselves inside and out. Moving to the United States in 1979 I was focused on following my dream of being a cosmetologist. I attended Classic Beauty School in Dallas, Texas where I learned the ins and outs of the beauty industry. Finally, my dream was coming true and as I continued to learn about hair, nails, and skin, I developed a deep desire to one day own my own beauty salon. After graduating and working in a few local beauty salons I met my husband, Ty Bucey, who’s career transferred our family to Minneapolis, Minnesota where I was given the opportunity to grow in the beauty industry and open my own beauty salon in a local shopping mall. After owning and running my first beauty salon, my husband’s career required another transfer to Scottsdale, Arizona. Picking up and moving to Scottsdale, Arizona was not an easy change. After owning and running my own beauty salon in Minnesota, I knew that I could do the same in Arizona. I had a passion for the beauty industry, but at the same time I also had passion for managing a team of employees towards success in this field of work. I stumbled across a beautiful store, located in Carefree, Arizona. This store was a previous beauty salon that ended up closing down, but what I saw that day was endless amounts of potential for success. I purchased the salon that had closed and created a fresh and relaxing environment where women and men would enjoy being treated with beauty services. My employees and myself slowly started to build what would become a large and faithful clientele. This salon is the first original Salon Mila AVEDA family salon to hit the Arizona beauty scene and continues to have a special energy that surrounds the Salon because it is the beginning of where dreams came true. The dreams did not stop at Carefree, AZ. 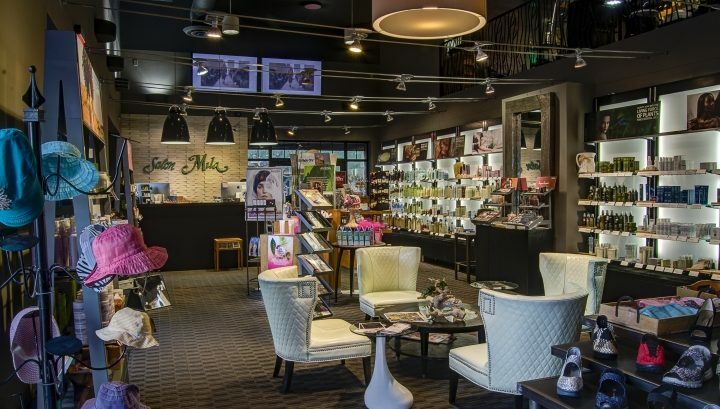 Salon Mila is currently at three other locations around Arizona and an additional two boutiques are connected to the original Salon Mila at El Pedregal to provide our clientele with the latest in fashion, lingerie, and beauty products. The second Salon Mila can be found at the Boulders, a Waldorf Astoria Resort, also an AVEDA family salon, which is only minutes from the El Pedregal location. The third Salon Mila opened up at the Phoenician Resort in Scottsdale. Salon Mila at the Phoenician is a proud AVEDA concept salon. Our latest project has been opened for two years in old town Cave Creek where Salon Mila prides itself on its first ever two-story building complete with endless body services available to our clientele along with being a loyal AVEDA concept salon. Salon Mila continues to grow and produce smiles on our customer’s faces- the same smiles that I dreamed about as a little girl.